We’re about to shift seasons again. That means a whole new influx of fresh fruits and vegetables that are typically grown at this time of year. While many of us are able to afford to eat whatever we want whenever we want it, we miss out by not eating seasonally. By choosing to eat produce when it grows we are often able to get food that is more nutritious, that tastes better, and potentially is grown closer to home. Seasonal Affective Disorder or SAD is a type of depression occurring at certain times of the year. SAD usually occurs during the late fall or winter months. It is believed to be caused by lack of sunlight since it occurs in higher frequencies in latitudes farther from the equator, where hours of sunlight are less during the winter. It may also be related to a drop in serotonin levels. Even young children can suffer from SAD. Here are the top three things you can do to help support your kids and keep them feeling great during the winter months. Because SAD is believed to be connected to limited light exposure, make sure that your children spend some time outdoors during winter daylight hours. Yes, it will be cold, but bundle them up properly and the sun exposure will do them good. Encourage them to get light exposure directly into their eyes (in other words, forgo the sunglasses). This is because light exposure, particularly bright light, through the eyes boost serotonin activity. You may want to make a point of having your children go out on weekends during the winter, as they will likely be shut in at school during the weekday daylight hours. If desired you can also buy special lights that are meant for treating SAD. Light therapy has helped many people who suffer from SAD. While it may be difficult for your children to play outside in the winter, the activity and sunlight will be very beneficial. This is because exercise and physical activity is a great way to fight depression, even SAD. You may find it effective to provide a space in your house for your children to be physically active. A partially finished basement or a room that you don’t need to keep in the best shape is perfect for this. You could put a small basketball hoop in this room or provide other activities that will encourage your children to be active. If provided with space and encouraged to be active, many children will jump at the opportunity. Lastly, proper diet is important in the treatment of SAD. As with all depression, make sure your children limit the amount of sweets and simple carbs that they eat. Eating a healthy, whole-food diet, low in processed food and artificial ingredients, can help to address nutrient deficiencies that may be exacerbating SAD symptoms. Consuming foods rich in Vitamin D and DHA may be particularly helpful in treating SAD. Vitamin D is produced easily in the summer sun by our bodies, but is limited in the winter, due to the angle of the sun and the reduced hours of sunlight. Fish and other types of seafood are high in both Vitamin D and the essential omega 3 fatty acid DHA. Both are commonly consumed by certain cultures who have a lower prevalence of SAD, despite living in latitudes far from the equator. Vitamin D can also be found in dairy products (be sure to choose organic in order to avoid added hormones, antibiotics, and other chemicals), eggs, and mushrooms (especially portabellas which are raised under appropriate conditions – these are sometimes found in the grocery store under the label “sun-bella”). If you feel that your kids may not be getting the Vitamin D they need through their diet, you could ask your doctor to have their levels checked. Your doctor may recommend a vitamin D supplement for the winter months. Try some of these ideas to help keep SAD away from your household and to get your kids through the winter blues. Don’t forget to smile and take time to relax so you can your family can enjoy a healthy and happy winter. Josiah Garber enjoys studying and pursuing health and nutrition. He works as Manager of Technology at Medical Support Products an online respiratory equipment and supplies company. Seasonal affective disorder, often referred to as SAD, is a condition that is getting a lot more attention lately. People are aware of the negative consequences of not getting sunlight. Yet while many people think that sunlight causes cancer, they don’t realize that the long wavelength of the Sun simultaneously detoxifies you from the damage from UVB. And it’s not only about the amount of vitamin D because vitamin D is absorbed within 30 minutes of sun exposure. Florescent lights, computers, cell phones, televisions, e-readers, and more all contain blue light. This light wave range is not helpful for those with SAD. Unfortunately the winter season is also when we are more likely to be exposed to these light waves because the days are shorter and we tend to spend more time indoors. We are also more likely to curl up on the couch with a good movie or another electronic device, making our exposure to this light wave even more significant. One way to reduce some of this blue light exposure is to wear special glasses which block this light wave. Although many new devices have apps or programs that can block the blue light, it may not be enough to significantly cut your exposure. Therefore glasses can be a useful option. Light from the Sun, predominantly the red and orange light, is a beneficial thing, especially during the shorter, darker days of winter. The reason most people usually notice a difference in their mood after spending time outside in the sunshine is due to the red and orange light waves that come from the sun. The more intense the sunlight is the more powerful the benefit’s are going to be. It’s important to note that a short period of intense sunlight is actually much better than a longer period of sunlight with cloudy weather. In addition to improving mood, sunlight can increase thyroid function; thyroid hormone is required to properly detoxify your liver. When you increase thyroid function you also regulate blood sugar and help support the body to secrete adequate amounts of stomach acid. This means that incorporating light therapy through the sun or the right types of lights is highly supportive of good health. SAD is a diagnosis that indicates you’re not getting enough of the correct spectrum of light. To remedy this, if you’re in a climate that doesn’t give you access to sunlight, you can purchase special lights and use those for a period of time every day. The best option for SAD, however, is sunlight. This is due to its long wavelength and the better concentration of red and orange light waves. While there are other pieces to the healing puzzle, such as organic foods and adequate sleep, light therapy is something that many people forget about. It appears to be very helpful with health problems, energy, mood, and anxiety. Nancy Farber is a strong advocate of light therapy and it’s benefits; she believes that food and light are the keys to healing. She can be found online at Benefits Of Light. Seasonal Affective Disorder, also called winter blues, summer blues, or seasonal depression affects about four to six percent of Americans severely. According to the American Academy of Family Physicians, SAD is four times more likely in women than in men, ten to twenty percent of Americans may have a mild case of SAD, and it usually isn’t found in people younger than the age of twenty. If you suffer from the above symptoms, you may have Seasonal Affective Disorder; however, there must to be a history of these symptoms for a couple years before it can be correctly diagnosed. According to Clinical Psychologist Kathy Hogan Bruen: “There’s a difference between feeling down and being depressed. Being clinically depressed means you have more than just a couple of symptoms and they’ve lasted for more than a couple of days. Before someone receives a diagnosis of SAD, they must experience this consecutively for two years. It’s not just ‘I feel bad one winter, therefore I must have SAD.’ There has to be a history there.” If you suspect you have SAD, seek a professional opinion. Self diagnosis is never a good idea. Research on Winter Seasonal Affective Disorder continues, but thus far the lack of sun is the most compelling cause since lacking sunlight affects the brain by increasing melatonin while decreasing serotonin and vitamin D levels in the body. When exposed to sunlight, your optic nerve sends a message to your brain to produce less melatonin. Melatonin is a hormone that calms the body and allows you to sleep. When the sun comes up your brain produces serotonin, a hormone that induces feelings of wakefulness. When the sun’s ultraviolet rays touch your skin, your body produces vitamin D. Vitamin D also helps the body maintain proper serotonin levels. So during the dark winter months you could have insufficient amounts of vitamin D and serotonin, but overly sufficient amounts of melatonin thus the depressive state. A research project done at the University of Alaska, Anchorage found that “as serum vitamin D decreased, symptoms of SAD increased.” Winter Seasonal Affective Disorder and the Mediterranean Diet Studies such as that of the University of Alaska, Anchorage lead us to believe that SAD can be controlled through diet. More specifically through a diet high in vitamin D which aids in the production of serotonin in the body. Psychiatrist David Mrazek on MayoClinic.com, claims that eating a Mediterranean diet can help. A Mediterranean diet is a diet high in fresh fruits and vegetables. 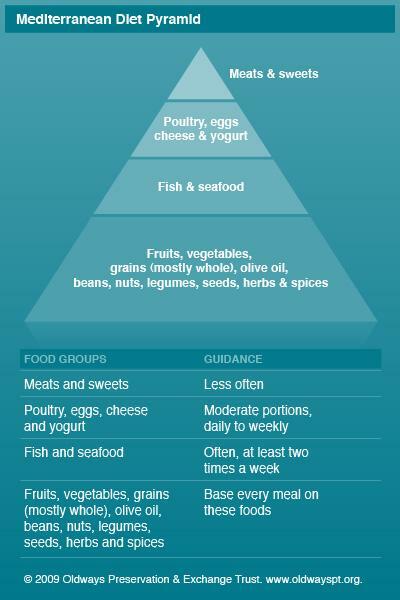 With the Mediterranean diet whole grains, healthy fats, fish, and lower amounts of meats can help reduce depression. According to Mrazek this diet can reduce depression by up to one-third. Dietary supplements also help with Seasonal Affective Disorder. In addition to vitamin D, supplements to add into your diet include: omega-3 vitamin B3 vitamin B12 and folate. Fish, and nuts contain high amounts of omega-3 while B-complex vitamins come from oily fish, beans, nuts, and whole grains. Herring, mackerel, salmon and flaxseed are the richest sources of omega-3 fatty acids. Key components of the Mediterranean Diet include exercise, eating whole grains, using olive oil, eating plant-based foods, such as fruits, vegetables, legumes and nuts. The diet also calls for the use of herbs rather than salt to flavor foods, enjoying meals with family and friends, limiting red meat consumption while increasing fish and poultry, and drinking red wine in moderation. In a study by R. J. Wurtman and J. J. Wurtman published in Obesity Research, it was found that consuming foods high in carbohydrates increases serotonin in the brain, which alleviates the symptoms of depression involved with Seasonal Affective Disorder. Excess carbohydrates may; however, cause unwanted weight gain and worsen depression. A study published in the International Journal of Eating Disorders supported eliminating simple carbohydrates from the diet of individuals with SAD, claiming this helped control the depression for a longer period. 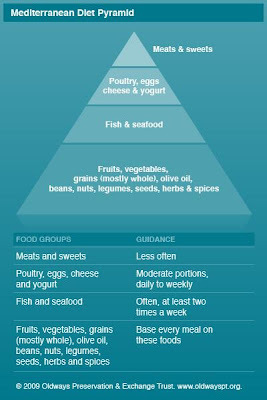 The consumption of carbohydrates and its effect on Seasonal Affective Disorder continues to be a controversial issue and the center of more studies; however, the Mediterranean diet in considered a low-carb diet, balancing the amount of carbohydrates with a variety of other nutritious foods and is highly recommended. Kate Hunter is a writer at Everlasting Health Center, Reno’s best vitamin, supplement, herb and health food store since 1995. She enjoys organic gardening, whole food cooking, and following up on the latest health food news. Katie obtained B.A. in English with an emphasis on writing from Southern Oregon University and has been writing about nutrition, healthy living, cooking, and gardening for over nine years. She is a mother of three and spends her time baking, canning, growing and drying herbs, and reading food labels of course. Summer, that season of fresh salads, greens, berries, and melons all bursting with healthful vitamins and nutrients, has passed. Autumn, however, also please our palates, providing us with different gifts of nature. There are many seasonal fruits and vegetables, which are just as tasty as summer while delivering different health benefits. Here are some fabulous fall foods (depending on your location) and their health benefits. Tomatoes – This berry provides high lycopene content, that rare plant pigment which imparts their red color to tomatoes and other fruits . According to several studies lycopene can prevent cancer, lower cholesterol, and appears to protect us from harmful ultraviolet radiation. In addition to lycopene, tomatoes are high in potassium, fiber and vitamin C, helps to strengthen the immune system before the influenza season. Cabbage – High in fiber, which supports digestion, can lower cholesterol, and provides cardio-protective benefits, cabbage is also rich in antioxidants which can protect the body against many types of cancer (including breast, prostate and ovarian cancers). Another benefit of this versatile benefit is that cabbage juice has long been known for it’s healing effects on stomach ulcers. Persimmon – Another berry, persimmons are high in fiber, and antioxidants. They also provide vitamins A, C, D, iron, potassium, calcium, copper, magnesium, manganese, and iodine. Persimmons can provide a fair number of health benefits from lowering blood pressure to being cardioprotective to it’s anti-tumor benefits. However, persimmons are also high in glucose and sucrose making them a poor choice for those suffering from diabetes. Turnips – A root vegetable containing potassium, magnesium, sulfur, iron, sodium, iodine and manganese, turnips are anti-cancerous while their high fiber content make them a great choice to lower cholesterol and support a healthy digestive system. One of the great things about turnips are that you can eat the greens as well as the roots, making them a versatile food to add to your diet. And those greens are just as loaded with nutrients as the roots, containing vitamins A, C, K, and folate. Turnip greens are even high in calcium making them a good choice to support bone health. Beetroot – Another root vegetable which has edible greens, beets are highly anti-inflammatory and support detoxification in the body. Beetroot is high in folate, manganese, fiber, potassium, and vitamin C while the greens are a great source of lutein and zeaxanthin, two phytonutrients which are especially supportive of eye health. While almost all products can be found in stores throughout the year, for freshness and higher nutritional content it is important to eat seasonally. Adding these autumnal foods to your diet is not only tasty and easy, it’s also good for you. Korah Morrison has been working as a freelance writer for over 2 years. She writes essays on various topics at Essay-Point.com and loves her work. It’s persimmon season. I love these tasty little fruits, with their rich fragrant scent and amazing flavor. Luckily for me there is a pick your own place not too far away. Each year I go and pick pounds and pounds of them. I eat as many as I can before they get so ripe and so soft that they are in danger of sliding out of the fruit bowl and off the counter. They have to be pretty soft before they are ripe enough to eat so this window is pretty small. When I get to this point I turn the rest into pulp to store in the freezer. This allows me to make cakes, cookies, and other persimmon delights for as long as the supply lasts. Apparently you can make jam from persimmons but I somehow never seem to get around to doing that. I’m also not sure if I would use it as I’m currently the only one in the house who likes persimmons. One of my favorite things to bake with persimmons are these muffins. They’re a great treat with a rich dark flavor that is so reminiscent of the crisp fall weather. I’m sure they would freeze well but somehow they’ve never lasted long enough for me to test that theory. I regularly teach a class on seasonal eating. What the benefits are and why we should look to consume more seasonal (and local) produce. Obviously part of the benefit is that seasonal foods are picked when they are fully ripe, especially if they are local, rather than being picked under-ripe and either stored or transported before being force ripened. This means that the nutritive value of the food is fully developed as well as it’s flavor. Anyone who has ever eaten a truly fresh tomato knows what I am talking about. Better for the environment: Eating seasonal, locally produced fruits and vegetables also helps to reduce the environmental impact of your food. If you think about it, why eat tomatoes from 2,000 miles away when you can get better tasting ones closer to home without burning massive amounts of fossil fuels? More flavor: as mentioned above, food that is picked when it is ripe, rather than when it is convenient to harvest, is going to taste better. The texture (which contributes to the taste and the enjoyment) is also better because the produce is not artificially chilled and then force ripened, all of which changes the produce. Support your local farmer: most often when you’re buying local, in-season produce you’re buying it direct from the grower. This helps to cut out the middle man. Farmer’s markets and CSA’s are a great way to meet those who are actually growing your food and to be able to talk with them about how they are growing your food. Less pesticides and toxins: most local, small farmers don’t use massive amounts of pesticides, insecticides, and other chemicals. This is where getting to know your local farmer is a big benefit. They’ll tell you what they’re not doing and explain why. Most often it’s because they’re growing your food in a way that nourishes the soil and that is more beneficial for the plants. Sure it may not look as consistent or “pretty” as what you see at the grocery store but it smells and tastes far better and has more nutrients. At my last class I got a question that I’ve gotten a couple of times before and I wanted to address it because I think it’s an issue that tends to get a little confusing for folks sometimes. It’s about the seasonality of food. I live in Texas. We have a very different growing season here compared to most of the rest of the country. We essentially have the equivalent of two spring-like seasons, one very hot season sandwiched in between them, followed by a cold, often rainy season. Learning to grow food here has proven to be a bit of a challenge. It’s nowhere near as easy or intuitive as what I’m used to having grown up in the Northeast. Luckily I have several local CSAs and Farmer’s Markets that help supplement our supply of seasonal foods with their expert skills. One question that comes up a lot is about what constitutes a season. The answer? Well, it depends on where you are living. I think the first, most important place to start is to understand the concept of seasonal eating and decide if this is something that you want to follow. We try to do so in our house for most things because we then get the ripest, best tasting produce by waiting for the season. It also means that we more fully appreciate our food by having to wait for it. I’m going to be honest and put in a disclaimer here to say that there are certain foods that we do not eat seasonally because we use them too much (such as onions, garlic, carrots, and celery) but in general we eat berries in the spring and summer, squashes in the winter and so on. If you’re looking to find a farmer’s market and get fresh, seasonal, local product a great resource for the United States is Local Harvest.